Our first look at the coast of Lombok has given us yet another contrast between the islands we've visited. The farther west we travel reflects a variation on a fairly central theme with technology playing a bigger role the further west we go. On Flores, I saw men repairing a road with buckets of cement they'd mixed by hand and using rocks they had hauled from the beach far below. Today, we saw a crew using a large CAT earth mover to do the same kind of work. Industry dots the shore line on the north coast of Lombok with fairly sophisticated generators providing power. Mechanization has a toehold here that we haven't seen much of til now. We had taken a mid morning break from paddling in the middle of a 'herd' of jellyfish when we noticed how fast we were drifting back the way we had come. The tide was strong, about one knot, heading toward the selat we crossed yesterday. Our forward progress is generally about three and a half knots, so it was no wonder the coast wasn't exactly zipping by. Well, actually it was, but in the wrong direction! To avoid losing any more ground, we hurriedly got stuck into the paddling, trying to make as much to the good before we got too tired battling against a strong tide. After five hours and only fourteen miles, it became important to find a campsite before low tide made a landing difficult. We spotted a black sand beach near some rocky cliffs which looked like a possibility. And, on a hot day as we've had recently, black sand is preferable to white as it seems to absorb heat rather than reflecting it. A large tree offered shade near the water's edge making this spot seem ideal. (Sometimes setting up camp can be a chore when you're trying to lift a loaded 'Queenie' up onto a beach before getting blasted by the next incoming wave, sand flies chewing on your ankles and running the gauntlet of locals who are crowding around to see the kayak!) But, this camp tonight appears quiet; no mozzies, few ants, and local fishermen who seem content to get on with their work.The pounding surf is the only distraction. I guess one can't be too picky! Just a quick one to say we made it OK across Selat Alas safely to Lombok. It did turn out to be somewhat of a struggle against a 3 knot southerly current. With our bow compensating a full 45 degrees to starboard of our heading we were able to keep on the intended course and avoid getting sucked south down the Selat. This was at slack water during high tide though! By the time we reached the other side the tide was beginning to kick in to the south also, thereby increasing the flow. So the crossing of Selat Lombok to Bali in a few days will be interesting. I think the emphasis will be less on where we end up on Bali so much as just making it to land somewhere on the east coast. Back in the mangroves getting eaten alive again on Pulau Lawang just off the NE coast of Lombok. Mt Rinjani peeking above the clouds on Lombok during the xing this morning. Before leaving the town of Sumbawa Besar we had a chance to visit the Dalam Loka, or old Sultan's Palace. Built in 1885 by Sultan Jalashuddin it was the hub of the Sultanate capital of Sumbawa that itself was controlled by the East Javanese Majapahit Empire from the 14th century onwards. The region of Sumbawa was well placed on the trade route between Java and both the sandalwood producers to the east in Timor and the Spice Islands to the north, and as such enjoyed considerable strategic importance and wealth. The Hindu Rajas from Javanese origin were replaced in the 17th century by the Makassarese of Sulawesi, converting the people from their animist religion to Islam. The Dutch East India had a limited stay here before being ousted by the Japanese in World War II, whose rule constituted a bitter period of the region's history. After the Japanese defeat Sumbawa became a part of the modern Republic of Indonesia, and although the Sultan's were no longer recognised by the central government, some of their ancestors maintain prestige as well as well the old Palace. The barn-like wooden structure we saw is all that is left. We tried to find someone to give us a tour but the guide was apparently asleep. Probably not a bad thing. The place looked on the verge of collapse, held upright only by a network of blue polypropylene ropes attached to nearby palm trees. Nice carving on the wood that we could see through the railings though. The crossing tomorrow will involve traversing Selat Alas, a fairly narrow strait of 8 odd miles that we hope to do in a quick 'dash' over slack(ish) water at around 1000am local time. It will be a dress rehearsal for the Big Daddy of them all, Selat Lombok between Lombok and Bali that we'll be tackling in around 3-days time. We're both quite apprehensive about that one. It's 20-odd miles against a predominantly southerly tidal stream (with the SE monsoonal pattern) with riptides and whirlpools on both sides thrown in as standard features. Tomorrow will, I think, give us a little idea of what to expect. We visited the Negeri 1 Jr. High School (SMP) today in Labuhan near Sumbawa Besar. It was interesting to be in school on a Saturday, only because my school runs on a five day week, Monday through Friday, for nine months of the year. Nurchasanah, the teacher responsible for the English speaking department, met Jason and I, along with the school's headmaster. We explained the particulars of our cultural exchange program, sponsored by UNESCO and the Ministry of Education Office in Jakarta. One part of our program involves linking schools through a global penpal program, each class having the opportunity to share a bit of their culture with another. Through the travels of the expedition, we have encountered schools along the route with amazing things to share about their corner of the world. We walked into a class of some forty students and began to share a bit of what we are doing, speaking in English. The classroom teacher and Nurchasanah assisted with translation in Bahasa Indonesian when the students began to look confused! We have learned they have an interesting background in languages before they begin school. The primary language ( or mother language they say) is the regional dialect from the island where they live. Some islands have several regional languages. Before they begin school, the students will be exposed to Bahasa Indonesian (Indonesian language) which is the primary language spoken throughout the country. Then, when the students get to upper intermediate grades, they also learn English, so the teachers today were very excited to have English speakers in their midst to converse with the students. We gave out letters from my students and explained that we would like to have them share their interests in letters, as well, to be posted to my school in Colorado upon my return. They seemed very keen on that idea! Before we finished the visit, Jason asked the students to identify some of the things that are most important to them. 'Friends' was first and foremost followed by family and preserving traditions of their culture. I have discovered, since my involvement with the expedition, that this seems to be a universal theme with kids everywhere we have traveled. The vision of children seems to be quite focused on similar objectives, no matter where they live in this global neighborhood. And, as their teachers said as we were leaving, creating peace through an understanding and tolerance for differences as well as identifying our similarities is so important in our world today. Through the eyes of children, it seems so simple. We're in the town of Sumbawa Besar resting up in the Hotel Tirtasari. Thirteen days of paddling every day (bar one) since leaving Flores has our arms and shoulders aching and fingers numb. Not to mention the constant exposure to salt water which has matted hair and beards alike! Paddling kayaks is really a fantastic way to explore Indonesia, but even it can get samey after a while if the routine isn't changed just a little. We'll recover here for 24 hours before continuing onto Lombok and then Bali to meet up with Chris around the 4th September for the paddle across the north coast of Bali to eastern Java. We also need to add epoxy to the underside of 'Queenie' where she's getting a little thin from dragging her up and down beaches, mend tent poles, catch up on email, resupply with food/water etc. All the proper things sailors do when they reach port. For the past three days we have been working our way around the vast peninsula of Gunung Tambora, site of one of the largest volcanic eruptions in the 19th century. To look up at its heights from sea level is quite impressive as it stands today at over 2900 meters or nearly 9000 ft. in elevation! Looking at the former lava flows from the summit, which extend into the sea, it is hard to imagine the incredible force with which this volcano blew its stack. The impact on the planet in that year of 1815 was a global climate change the following year which lowered temperatures as far away as the U.S. and Europe (Snow fell near London in August of that year.) Now, nearly 200 years later, the peninsula is forested over with lush vegetation and inhabited by monkeys, cattle, and goats, with an occasional village dotting the coastline. I'm sitting in Tambora's shadow as I write this update. We are camping this evening on the shores of Pulau Moyo, a naturalist's dream. It is reassuring to know it is a national park with protected species of wildlife and reef systems. The island lies a few kilometers off the north shore of Sumbawa and we are sharing space with native deer, crab-eating macaques, wild pigs, snakes and monitor lizards. In the next couple of days, we will arrive in Sumbawa Besar for a couple of days to restock with supplies before the next crossing toward Lombok. The trips into towns require a completely different mindset, so for the present, I shall relish the space I'm in at this moment in the shadow of gunung api, Tambora, or fire mountain. We've taken some good chunks out of the chart this past few days to get the expedition back on schedule (currently a week behind). All revolves around our visa renewals from now on. We need to reach Bali around the 4th/5th Sept for our 2nd visa renewal at the immigration office in Kuta (oh joy). We then have 30-days to bike across Java for our third (and hopefully last) renewal in the capital Jakarta which should be enough to finish the trip to Singapore. We took an especially big chunk out of the chart today to cut across a bay in which an incident of piracy occured in the southern part by the village of Sanggar just a few weeks ago. According to some tourists we met in Labuan Bajo their boat was accosted by a speedboat (posing as police) and held hostage for 8 hours with a demand of $500 US (an incredible sum of money for around here - they should have been a little more realistic!). Anyway, the tourists apparently refused to pay and were eventually let go. I very much doubt something like this would be repeated twice in the same month, but we decided on giving Sanggar a wide berth nonetheless. Tonight we're camped on the shores of Tambora volcano that makes up a huge peninsular jutting out from the north Sumbawan coast. In 1815 it blew it's top off sending 150 cubic kilometres of debris into the air and killing some 20,000 people outright and a further 80,000 odd subsequently due to famine and disease (a massive number for back then - bigger than Krakatau). More on this smoking monster in April's next update in 2-days time (if the computer battery lasts). Oh, for teachers and students reading this there should be some lesson activities posted on the educational blog section (see right hand nav bar on this page) for Komodo dragons. There's a huge monkey sitting about 15 feet away from me ('Ouch, not you April!'). I'd been thinking quite a bit about the crossing we'd be making across the Sape Selat. Selat crossings are always tricky as the currents, winds, and tides can become quite difficult. The locals are happy to give dramatic accounts of why you shouldn't cross them in a kayak, as well! So we left Komodo for Gili Banta, a stepping stone in the middle of the selat, the plan to make the crossing in two sessions. Jason had climbed a hill on the north shore of Komodo to check for slack in the tides the day before so we would have an idea of what to expect and we set off. All went wonderfully well until we reached the headland on the north shore of the island. The winds turned against us and the swell coming off the headland became huge breaking waves. ''Queenie" as I affectionately call her, handled that water perfectly, and hats off to Current Designs for their construction of this amazing Libra XL. We found a small spot of sand to camp on before our next big day to finish the crossing. I was a bit intimidated with what was to come, but there was no getting around it; there was only one way to get to Sumbawa and it was going to be a tricky bit of water. We rounded another headland before striking out to the west, then hit the open water. Sumbawa was not in sight and that was a bit of a rush heading out into open sea without sight of land! The crossing proved to be a lot easier thanks to Jason's planning and it was a walk in the park right up til we rounded the northern most headland of Sumbawa. We were to be traveling along the north shore, which is exposed and full of reef systems. Add to that, a strong wind in our face that had us in a real roller coaster ocean. By this time we had been paddling for eight hours and it was getting dark. 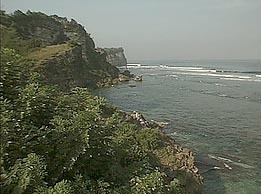 The shore line continued to lack sand, only coral reef and volcanic rocks. We continued, hoping for a break as we were both exhausted. The break appeared in the form of a sliver of opportunity, a point of sand between two rocky cliffs. It was a one shot deal to hit that beach between rocks in a breaking surf fueled by strong wind. To position ourselves, we had to turn "Queenie" 360 degrees to line her up with the shore and hope we could hit the beach spot on. The kayak spun around, we paddled like crazy, and with help from God and luck, we shot up onto the black sand, bailing out to pull our kayak to safety. What an incredible finish to our selat crossing! I wouldn't have had it any other way. By the time we finally rolled into camp here on the NW tip of Komodo the evening before last it was already dark. We'd had a long haul across the northern coastline of Komodo island and we were both exhausted. Paddling in the afternoon means we have the sun in our faces which seems to take it out of us all the more. So yesterday we decided to rest up and regain our strength for the big crossing of Selat Sape, a 7 mile stretch of potentially turbulent water between here and Gili Banta, a stepping stone island for us to reach the island of Sumbawa, a further 15 odd miles the other side. It's crucial for us to get the timing right in terms of tide and the wind, otherwise we might find ourselves being swept out to the north by an incoming tide of 8+ knots that will make for a very long (i.e. 30+ miles) crossing all the way to the NE tip of Sumbawa. This wouldn't be good. We plan on leaving our deserted beach here in a few hours at around 12 noon local time. Low water is at around 2pm so hopefully we'll hit slack water midway into our xing. And if the wind does come up (forecast for force 3-4) the at least it'll be going the same direction as the tide after 2pm, avoiding an incomfortable (and potentially hazardous) wind versus tide scenario when the waves can get really big. It's also been nice to linger a little longer in the truly wonderful Komodo National Park, which takes in several outer lying islands in addition to the two main ones of Komodo and Rinca. Apart from it's incredible natural beauty (people haven't been allowed to trash it), two of the most attractive aspects have been the lack of insects (no mosquitos, and just a handful of ants) and abnsence of people. It's been fantastic to have the isolated beaches all to ourselves, without the threat of locals pouncing on our privacy with the customary (and now quite wearing) 'Hello Meester'! Once we reach Sumbawa it'll be back to the fishbowl experience, I suspect all the way up to Singapore. We're leaving the wilderness now and the further west we go the more locals. The Komodo dragon is actually a monitor lizard, which range from a tiny 20g/20cm long to the big daddy of them all - the Komodo dragon. Komodos dragons can grow up to 4 metres long and weigh in at 100kgs (220+ lbs).Their best weapons are their sharp teeth and dagger-sharp claws, which can inflict severe wounds. They threaten by opening the mouth, inflating the neck and hissing. It often rises up on it's hind legs before attacking and the tail can deliver well-aimed blows that will knock down a weaker adversary. They feed on other animals: deer, wild pig and even water buffalo that inhabit the islands. Although able to outrun deer (or certainly a human!) for short distances they typically lie in wait beside an established game trail. Hidden by their superb camouflage they strike at close range and on large animals inflict one (mortal) bite, then let go. The bacteria in their mouths is so potent that their prey will die within a few days of the infection and the dragon/s get to have their meal, if a little delatedly by that time tender with decomposition. The 'ora' (local name for Komodo dragons) also eat their own dead. Tonight we camp on Komodo Island having run out of daylight to reach one of the outer lying islands that are, according to the rangers, 'dragon free'. We arrived at 'Loh Liang', the ranger station at around 11 am this morning after a fairly intense passage in strong current around the southern edge of 'Toro Kuning', a headland around which the tide can rip at 7-8 knots. It's a very disconcerting feeling for the boat to be essentially taken from underneath you and torpedoed forward faster than you can paddle it. It's then like being in a river, the main thing is to steer rather than paddle, and keep the stern of the boat from being swept around bringing the boat then parallel to the flow. This would then increase the likelihood of a wave pushing the boat over, rather like a broach in 'Moksha'. But we made it OK, and tonight we have other dangers to accommodate. Having been given a guided tour by a ranger of several of the dragons and told grisly tales of tourists disappearing on the island when they ventured off the beaten track and a child from the local village having his leg torn off, we're putting more attention into campsite defense tonight. We have our security perimeter alarm system (thanks Sharon!) that should give us early warning of an intrusion, plus 2 x stout sticks at the ready and the loaded speargun (thanks John!). I suspect it's overkill. The dragons are supposed to quite lethargic at night (being reptiles they rely on the heat of the sun to regulate their body temperature). However, they are attracted to cooking or the smell of food. So we'll no doubt be having a cold supper tonight on dragon Island. The blue waters of the bay moved from my paddle as if I'd never been off the ocean for the 12 day haitus in Labuan Bajo. It felt soooo good to leave this morning, even though the packing of the double kayak was quite a production. Jason and I need to plan for a possible 10 day stretch before being able to resupply so we loaded up on the food and water. After a three hour session to organize and reorganize the gear in the double kayak, the Queen Mary, as she is affectionately called at times, was ready for departure and I was keen to get into the rhythm of kayaking once again. We had perfect conditions with little current and wind to affect us and we quickly put distance toward Komodo Island, our next stop for dragon watching. A couple of dolphin groups escorted us, cavorting, blowing, and leaping out of the water, much to my delight! That is something a person never tires of seeing. Even a school of tuna got into the act, but one of the dolphins got the better end of that deal as we saw him surface with a large fish in his mouth! As we neared Komodo Is., we knew that not only do the dragons inhabit Komodo and nearby Rinca, but can also be found on the smaller islands in the area. That thought had us on the lookout for a camping spot that would provide us with a bit of piece of mind. We had no idea that we would end up in the most amazing place we had ever seen in Indonesia. The beach we landed upon was deserted and seemed ideal with no one else in sight. After unloading gear and setting up camp, we decided to climb the hill above camp. These islands all have a volcanic backbone which stetches from one end to the other. As we neared the summit, the view was absolutely breathtaking. When you are in an island group, the hills of distant islands and the water that separates them takes on another dimension compared to seeing them at sea level. We continued to climb each hill until we arrived at the summit of the island. We were delighted to find that our only encounter with an inhabitant was a rather fat, brown and white wild goat! But, the most amazing sight was a 360 degree view of the surrounding islands as the sun set in a fiery red ball in the west. Coral reefs, surf breaking upon white sand beaches, even a square rigger gliding up the narrow strait between the islands, will always be one of my greatest memories. And, tomorrow, we see the dragons of Komodo...unless it is sooner than we think! I'm back in Labuan Bajo after a white knuckle experience at the immigration office Wednesday morning. My flight back from Bali to here on Flores was at 10.30 am. When I arrived at 8am at the immigration office in the hope that they'd turn the application process around in time to get my flight I was filled with optimism when I was asked to take the application forms to the cashier and pay the fee. 'Great' I thought, 'This must be the last hoop to jump through'. But the forms then had to returned to the myriad of desks manned by the rows of brown uniformed worker bees and there they sat unattended on a table until 9.30, an hour before the plane was due to depart. It's often hard to know what might be inappropriate behaviour here in Indonesia. Certainly losing one's temper is very much frowned upon. Much offense can be taken even if your eyes are too wide and round when you say something, as opposed to more 'squinty' + therefore obsequios. I opted instead to make a show of pacing back and forth raising my watch every second stride. Eventually the passports appeared and I made a mad dash for the airport with just 30 mins to spare. Tomorrow morning April and I plan to leave from the Mutiara Hotel in the Librat XT bound for Komodo. We'll have to spend at least one night on the northern tip of the island before making a second hop to Gili Banta then across Selat Sape to the island of Sumbawa. This will be the trickiest part with the tide running at up to 10 knots between low and high water. One thing we have in our favour is it being neap tides at the moment, so the water will only be running at 5 knots at full flood or ebb. Still a pretty unpleasant prospect and certainly made triply worse in a wind versus tide situation. We'll just have to take our time and get the crossings bang-on over slack water. The longest stretch from Gili Banta and the island of Sumbawa will take a good 5 hours to cross, so at either end of this window we'll have to deal with some strong current. But I think one of the most amazing experiences of the next 3-weeks will be camping for one night (illegally - national park) on Komodo. Aside from the rules and regs it's bizarre to think there'll be wild dinosaurs roaming around us, quite capable of taking down a human (the last one taken was a Swedish tourist back in 1997. All they found was his glasses!). Kind of like being in Jurassic Park. I think that if we can find a beach that has a steep cliff behind it - that the beasts can't climb down - then we'll be fine. I've had one big lizard experience on this leg of the trip already (the croc debacle in Queensland back in April this year), and that was enough. Still, we'll probably take it in shifts to stay up on stag holding the speargun and a stout piece of timber. Like crocs, apparently they have sensitive noses and a 'good belt around the snout should do the trick' so we've been told by one of the local tour operators. Have any of you reading this ever been to Kuta? Christ, what a nightmare. So many large-bellied Brits, Aussies and Germans waddling around the streets wielding a Bintang beer in one fist and an ice-cream in the other. Such a contrast to the relative modesty of most (but not all) Balinese people. Bizarre. It's all I can do to stop myself from running away screaming from the place. I'm still hoping beyond hope to be able to fly back to Labuan Bajo this Wednesday morning. The key issues that still need to be resolved are looking good though. A new adapter for the laptop has been located in Jakarta and can be got here for Tuesday. It's going to cost 1,500,000 rupiah - around $150 USD. I know I'm being ripped off (the same adapter can be bought for $40 in the US) but they know I'm desperate and have no other options. Expensive ding to the kayak this is turning out to be. At least this will mean we can update this blog when we're out in the field though. Perhaps the biggest part of the puzzle however is getting our visas renewed for another month. I knew this would be the biggest hassle of the whole trip and indeed, it is turning out to be the biggest hassle of the whole trip. So far I've spent a small fortune and all of Wednesday, Thursday and Friday running around in a taxi with my local 'fixer' Gomang (he's Hindu, speaks a little English and has the patience of a dead saint) - picking up forms from one office, faxes from the sponsor in Jakarta from another. The immigration office in Denpasar told me outright that we were on the wrong visa and we'd all have to leave the country and reapply! "Oh, could I pay a 'penalty' to get these visas renewed without leaving the country?" I asked with my stupid expression on. "Hmmmm, come into my office. Maybe there is a way" was the reply. 2,000,000 rupiah? I don't think so. So off to the other immigration office near the airport (where I should have gone in the first place). "No problem, you can renew this visa here". But then we needed more faxes from Jakarta of ID cards of the sponsors, special stamps from the post office that had to be located on a particular part of the form. April and Lourdes sent their passports on the Friday flight from Labuan Bajo as it turns out I can renew everyone's visa even in their absence. Instead of picking them up from the plane as it landed (as I'd been told I could do), Gomang and I were sent off on a wild goose chase around Denpasar for the mythical 'Kristal Cargo' office that, after 2 hours of stress and anxiety that the passports where already out on the streets getting flogged to potential suicide bombers, ended up being back inside the airport terminal where we'd started out from. Indonesians will rather tell you the wrong directions to a place than admit they don't know where it is, perhaps so you don't get disappointed. It's lucky I didn't have a blunt instrument with me after the 5th person gave us the wrong directions as I would have happily got Gomang to drive back the way we'd come and use it to illustrate how disappointed a person can really get. So the upshot of all this nonsense was missing the applications getting to the immigration office before the weekend. Tomorrow morning the circus starts again when I make my appearance (in trousers and a long-sleeve shirt - they won't allow shorts or T-shirts) at the 'visa extensions' window. I then have to ask my 'friend' sitting behing it (he so sick and tired of me and my questions, but unless you hire an agent to do this there's no one else to tell you how fill out the wretched forms) if he can 'help' me get the visas turned around in 24 hours, instead of the usual 3-days, so I can still get my flight on Wednesday. This will inevitably involve some kind of extra 'fee' that will be agreed upon in a back office. While the tourists and expats that I've met here moan about corruption, on the flip side it doesn't take a genius to realise that this is one way for government employees making 500,000 Rp a month ($50) to make ends meet. And from where I'm standing it's either that or shelling out for the privilege of spending two more days of my life in Costa Del Kuta. Chris is planning on taking a couple of weeks away from kayaking to rest up his back and do a little traveling on his own. Everything's fine between us. I think he just fancies a little something different from the monotony of paddling 15 miles every day. Most likely he, April and I will meet up again in Bali in around 3-weeks time and bike across the island of Java together. In the meantime April and I plan on continuing from Labuan Bajo across to Sumbawa and onto Lombok and Bali. We plan on keeping to the north of these islands as I've seen the surf on the south side of Bali near where I'm staying and I'd be VERY afraid to try getting to shore along any of these beaches! Our first hop across to Sumbawa will be the most tricky. We have 20 miles to the island of Komodo (via 3 or 4 other smaller 'stepping stones') where we inevitably have to spend one (sleepless) night, taking it shifts to hold the spear gun and keep the fire stoked high to ward of those nasty dragons. Then there's the Sape Selat to contend with crossing onto Gili Banta Island (giant turtles supposedly) and then to Sumbawa proper. I think we should be making the crossing during neaps if my calculations are right, otherwise the water can run at 10+ knots through here at full flood during springs. Not fun. Sounds like a breeze compared to getting these visas renewed. What an ordeal - more tomorrow on the immigration circus ride tomorrow. Where is Ina and her bureaucratic string-pulling when you need it! OK, reached Bali OK via the GT Air flight from Labuan Bajo. I've taken on the task of renewing visas for myself, April and Chris. They've stayed behind to look after the gear and potentially arrange either for two single kayaks to be shipped onto Bali for the Sumatra section, or find a couple locally who might want to paddle them to the eastern edge of Java (fancy an adventure anyone? Now's your chance!). Which leads me onto what on earth's going on with the trip at this point. Lourdes and I have decided that after traveling for almost 3-months now we will go our separate ways. Although we had a bit of verbal fisty-cuffs one evening (damn that Bintang), we've parted as good friends. We get along great in 'normal' situations, but we've found the context of traveling together a tough one. I know Steve and I had this problem way back at the beginning of pedaling from the UK to the US. Sometimes traveling together for an extended period in difficult conditions leads to pressures and stresses that put the best of friendships to the test. So rather than part as enemies, Lourdes and I have decided to cash in while the going was good and travel separately from now on. She's decided not to take her kayak on alone to Bali, largely due to the security risk of traveling as a single female in this part of the world. At the time of writing I believe she plans to take an extended ferry trip to the island of Lombok via Rinca (to see komodo dragons) and Sumbawa. She'll extend her visa here in Bali and I guess decide where her adventure takes her next. I do wish her well and hope she's recovered from what must have been a humdinger of a hangover after our last night in Labuan Bajo together at the Paradise bar drinking the local 'Arak' palm whisky (lethal stuff). I have a final image of her listing dangerously to starboard on the back of a moped/taxi taking her back to her hotel. More tomorrow. Sorry - my head hurts too. Just a quick note to let friends and family know that everyone is alive and kicking. We reached Labuan Bajo a couple of days ago. I'm heading to Bali to renew my visa - more details tomorrow I hope once I get to an internet cafe.